It’s that time of the month again, where the three main software collections of the KDE community have had new releases. Time to package and release for Slackware! 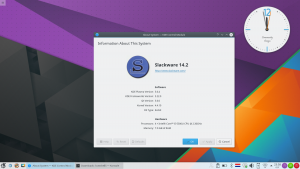 KDE 5_16.06 is the June release of the combined KDE Frameworks 5.23.0, Plasma 5.6.5 and Applications 16.04.2 for Slackware. You will certainly have noticed that I am still using the words “current” and “testing” in the URLs for my Plasma5 Slackware repository. With the release of Slackware 14.2, I want to change that. The Plasma5 repository on http://alien.slackbook.org/ktown/ will move from “current/testing” to “14.2/latest” to indicate that I no longer consider Plasma5 a “testing ground”. Plasma5 is production-ready as far as I am concerned. When a new iteration of slackware-current starts rolling post-14.2 I will see if there is again something that needs “testing” otherwise “current” and “14.2” will become equal in the repository for the time being. What’s new in KDE 5_16.06? Plasma 5.6.5 is the final bugfix release of the 5.6 series – Plasma 5.7 is going to be released in a couple of weeks. See https://www.kde.org/announcements/plasma-5.6.5.php . Applications 16.04.2 is also a maintenance release. See https://www.kde.org/announcements/announce-applications-16.04.2.php . Qt5 and Qt5-webkit packages in the “deps” directory have both been upgraded to 5.6.1 as per request of the Plasma developers who had a lot of issues with Qt 5.6.0. And krdc does not have to be recompiled any longer to enable RDP support. All you need to do now is add a freerdp package (not yet in my repository – does anyone need this?). This upgrade should be straightforward if you already have Plasma 5 installed. See below for install/upgrade instructions. And if you want to check it out before installing, I am currently generating new Live ISO’s for all variants, PLASMA5 included. 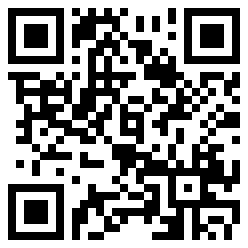 They will become available at http://bear.alienbase.nl/mirrors/slackware-live/latest/ soon. Check the timestamp of the “slackware64-live-plasma5-current.iso” ISO. Posted: 15 June, 2016 in Slackware, Software. Thank you Eric! So far it’s working ok here. 2016-06-15 14:47:17 ERROR 404: Not Found. 2016-06-15 14:47:18 ERROR 404: Not Found. 2016-06-15 14:47:21 ERROR 404: Not Found. 2016-06-15 14:47:22 ERROR 404: Not Found. But still work to get a new KDE 5_16.6, thanks Eric. Arief, that is caused by an update in slackpkg+ without consideration for the consequences. The 404 errors are actually harmless, it is a pity that by default they are not hidden. jla, indeed you will have to blacklist those packages if you are running “slackpkg.install-new” and want to get rid of these packages in the list. Alternatively you just skip them. You should not have a need for “slackpkg install-new” anyway at this point, since no new packages are being added to Slackware-current now and stable releases rarely, if ever, get new packages. I have applied this update. I have just one thing, i have noticed that comes and goes…. in my last couple of log ins and outs and a couple reboots. the Clock in displayed as analog and i get the following error. Thank you very much for all the great work on all your packages! I’ve just started using KDE 5_16.06 and everything seems to be working but Kmail inbox sync with yahoo imap. Have you come across the same problem? I do not use Yahoo, and I also do not use KMail, so I can not comment on your issue, of which you are not giving detailed information. Usually when you run into a KDE related issue it is good to do a search in the KDE bugtracker and open a new bug if you do not find any recorded bug related to your own issue. just today I installed KDE 5 on a full, clean install of Slackware 14.2 64-bit, after “slackpkg remove kde”. After rebooting I ran xwmconfig and selected the plasma entry. KDE Plasma 5 does, however, start OK when I log in at runlevel 4 (KDM). Gerard perhaps you just need to reboot. And, do not try to start Plasma5 as root. Rebooted twice, and never log in to GUI as root. Anyway, it’s Saturday evening and the football’s on, so ignore this. It’s not a major problem; just thought you might want to know about it. KDE 5 is great by the way. Very impressed. Good work. I can’t get the user picture dialog to show up. I want to change the picture associated to my username when i open up the start menu. A click on the default icon should bring up said dialog but it doesn’t work. It’s a minor bug i know, but still : Sharing is caring. Interestingly, the Personalization menu in System Settings only contains the KDE Wallet settings. It should also have listed Password & User Account – the place where you change the user icon. No idea where that went. If you want to change your user icon anyway, just pick a bitmap file and name it “~/.face.icon” . OK: running the command “kcmshell4 kcm_useraccount” will get you the “Password and Useraccount” program where you can pick a new face icon if you want. At some point I will have to investigate into Plasma’s “user-manager” which is replacing this old KDE4 program. I am currently not compiling a package for it because it has unmet dependencies. wayland-1.11.0, libxkbcommon-0.6.1, openal-soft-1.17.2, grantlee-5.1.0, PyQt5_gpl-5.6. Gonna test that kcmshell thingy. Looks like some library (Wayland related is missing). Is something missing from the deps directory? I have rebuilt those packages and updated the repository. I noticed, however that two packages are missing: breeze-gtk and plasm-workspace-wallpapers even though they seem to be present in the source directory. Are you going to update those as well? I was not planning on rebuilding them… I moved them out of the repository into the archive by mistake. Bad use of wildcards in the move commands. I’ll move them back and re-generate the repository metadata. Thanks for spotting all this, manciuleas. After rebuilding the missing packages I still had the same problems as reported. However I realized that something is wrong with the window manager and tried to start kwin_x11, which failed due to missing dependency (libinput.so.10) – this seems to be another wayland bit. Anyway, I tried to recompile kwin-5.7.0 and it failed because the kwayland the you ship (kwayland-5.6.4) is too old). So, I found and compiled kwayland-5.23 from frameworks, then kwin-5.7.0 (successfully now) and I have a working desktop. 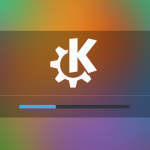 manciuleas – when I refreshed the repository with Plasma 5.7.0, I also replaced kwayland-5.6.4 with kwayland-5.23.0 (kwayland moved from Plasma to Frameworks but I had missed that last month). Perhaps you missed that one when you updated the Plasma packages. do you think is possible to make the fingerprint reader working in slackware? Updated again, now everything seems fine. Thanks. MG – the only fingerprint driver that I know of, requires that PAM is present. So for the moment this is not possible in Slackware. Ok, I’ll wait… thanks a lot! But when I use Alt+F2 to pull up krunner and search for any files in my home directory, the only ones that come up are the “Recent Documents.” Does it work for you? Just refreshed with new plasma 5.7 from today 14/07/2016 including libinput. Skype icon disappeared and Folder View plasmoid display the target folder and not its contents. Quick follow-up : removing the sni-qt package brings back the skype icon. Installed the latest version from the UK mirror. Works very smoothly and with full function. rvdboom – I may have to recompile a couple of Qt5 related deps. Gérard, so you rebuilt kde-baseapps using the source? The setting “XDG_RUNTIME_DIR=/var/tmp” is indeed not correct. I Seem to have deleted the final version of the kde profile scripts and left a non-working version in the repository. I discussed the XDG_RUNTIME_DIR variable with Martin Graesslin (KWin developer) and he insists that XDG_RUNTIME_DIR is set and points to a directory on a tmpfs or else the Wayland compositor will not start. Of course, my ktown packages do not support Wayland (yet) but the change in the profile script was meant for Wayland. But I will have to test that, I have just started working on a new set of ‘ktown’ packages. montagdude – the search function works for me. Ok, well thanks for letting me know. It’s not working for me on either 14.2 or my -current VM, so obviously I’m doing something wrong. I have the file search enabled with the default settings. If you or anyone has any ideas, I would appreciate it. It’s not critical though, so don’t spend a bunch of time on it or anything. Great work on KDE 5, Eric. It went in like butter on my newly upgraded Slackware 14.2 32-bit system. Just wondering what happened to K3b. Would it be okay to install it from the Slackware 14.2 DVD? Thanks! Using the default search settings. Balooctl restart hangs. Guess it time for me to RTFM. Yes I see what you mean. I booted the Plasma 5 Live ISO in a VM and there I notice that baloosearch works but krunner does not show any of the baloo search results. I must note that in the Live OS, I disable all kinds of stuff that tax the performance and the USB stick’s durability (turning off file I/O like all the search features) but I erased the live user’s dot directories and logged on again, and still krunner does not show search results from file content. Strange thing is that on my laptop, search works fine. I’ll wait for the chance to create a new Live ISO with the latest Plasma 5 packages to see if that changes things. Could be a packaging issue (iincorrect build order perhaps?) but I can not find fault, and it would contradict the fact that on the laptop it works. I just tried on the VM where I built the new set of KDE 5 packages (Slackware64-14.2 minus all the KDE4 packages) and here, the file content search in krunner just works. I copied a couple of new files over into the VM and those were picked up by baloo and seconds later I could find their content in krunner. Weird, no? As soon as the 32bit compilation of Plasma 5 packages is done, I will finish my work on liveslak scripts and create a new Live ISO. It’s more of an annoyance that a problem for me on my end. So far I have been very satisfied with your KDE 5 packages, not much to complain about. For what it’s worth, I also tried getting rid of .kde, .config, and .local (the last two just for good measure) on my VM, and I still have the same problem. It’s strange that it works for some people but not others. But like ska said, it’s just a minor annoyance, and everything else is working flawlessly. File search now works for me after the latest updates. Thanks again!